A 6-year-old female patient with the chief complaint of pain along with burning sensation in relation to the gums between her upper-left back teeth for the past 10 days. 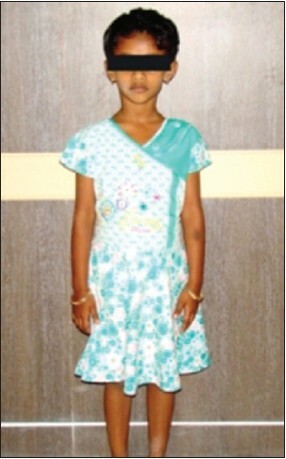 At the time of the clinical examination, the patient had a healthy appearance and seemed relaxed and communicative, average in her studies at second standard with normal IQ level. Socio-economic status revealed that parents were from middle class socio-economic background leading a happy contented life. During the intraoral examination a bite-wing radiograph was taken to rule out for any foreign body impaction or proximal caries. There was evidence of gingival stripping on the buccal surface extending 4 mm apical to the cement−enamel junction and a narrow zone of attached gingival margin measuring approximately 1 mm [Figure 1]. There was also loss of papilla height on the distal aspect of the first deciduous molar tooth. The gingiva in this region was edematous, reddish, and had an ulcerated appearance ("the ulcer looked raw"); plaque deposits were minimal. The parents were interviewed regarding any unusual practices or habits involving the child's mouth. Mother indicated that the child pricked at the area with her fingernails and also child patient had a habit of left forearm sucking, since birth for the past 6 years. A Hyperpigmented area of 12 × 7 mm was visible in the left forearm region [Figure 2]. A detailed family history was taken to rule out untoward family background. All were negative and not supportive for the cause. It was concluded that severe gingival stripping and hyper-pigmentation on the forearm observed in this case was primarily the result of self-injury. 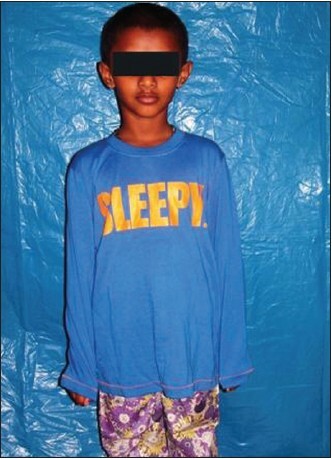 It was recommended that a full arm sleeve covering the arm and fingers during sleeping and play hours can be used for habit breaking [Figure 3]. Selective grinding of cusps was done on the lower-left first and second primary molars. Topical anesthetic gel was prescribed. 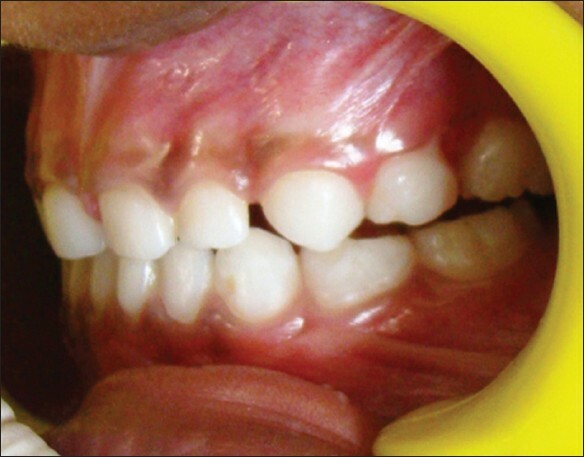 After 1-month follow-up, the gingiva in relation to the upper-left deciduous molars healed [Figure 4]. After 1-year follow-up, the parents reported that the child discontinued the habit of NB and also the forearm sucking frequency was reduced. Dermatological management for hyper-pigmentation on the left forearm scar was done. Management of SIB is still a challenge for the dental profession and for many clinicians it is a diagnostic challenge. SIBs often involve and can potentially compromise the form and function of the oral tissues. In these situations, dental management is required as the team approach to protect the patient's overall health. The dentist's goal in treating SIBs is focused on preventing harm to the soft tissue from the traumatizing dentition while minimizing the risks of compromised oral hygiene and other common oral illness secondary to any appliance therapy. Stewart and Kernohan  have suggested a classification system for self-inflicted gingival injuries. Type A: injuries are superimposed on a pre-existing condition, such as herpetic lesions or localized gingival infection. Type B: injuries are secondary to established habits, such as finger sucking or NB. Type C: injuries have unknown or complex etiologies. These would include injuries due to psychological problems. The following guidelines might be useful to clinicians who confront patients with unusual self-inflicted gingival lesions: a detailed case history including oral hygiene practices, history of any deleterious oral habits, previous history of similar lesions, and present emotional status of the patient and parents. Evaluate suspected lesions according to Stewart and Kernohan's features for self-inflicted gingival injuries. Lesion fails to regress with palliative therapy. Failure to remove the cause will result in persistence of the lesion. A biopsy of a self-inflicted lesion reports a non-specific inflammation 'microscopically'. In this case, gingival recession was diagnosed as being caused by the patient's SIB. They did not correspond to any known disease. The ulcer was unilateral with a bizarre configuration, and in a position that can be easily reached by the patient's hand. The patient's mother confirmed the child's habit of scratching the gingival tissue. There is no method to completely inhibit this self-mutilation. Many methods have been tried to palliate and prevent the trauma. Continuous positive reinforcement while self-mutilative responses are absent. Withdrawal of positive reinforcement upon self-mutilation. Although the diagnosis of self-inflicted oral mutilation may be a challenge for the pediatric dentists, this should not prevent the consideration of this possibility when idiopathic lesions are present in a child. Appropriate preventive methods need to be developed for each patient based on reasonable consideration. 1. Spencer RJ, Haria S, Evans RD. Gingivitis artefacta-A case report of a patient undergoing orthodontic treatment. Br J Orthod 1999;26:93-6. 2. Chen LR, Liu JF. Successful treatment of self-inflicted oral mutilation using an acrylic splint retained by a head gear. Pediatric Dent 1996;18:408-10. 3. McMullen JA. Inflammatory periodontal disease: Etiology and additional local influences. In: Goldman HM, Cohen DW, editors. Periodontal therapy. 6 th ed. St. Louis: Mosby; 1980. 4. Ghanizadeh A. A review on clinical approach to nail biting or onychophagia. Iran J Med Sci 2011;36:73-9. 5. Stewart DJ, Kernohan DC. Self-inflicted gingival injuries: Gingivitis artefacta, factitial gingivitis. Dent Pract Dent Rec 1972;22:418-26. 6. Pattison GL. Self-inflicted gingival injuries: Literature review and case report. J Periodontol 1983;54:299-304. 7. Brasic JR, Barnett JY, Ahn SC, Nadrich RH, Will MV, Clair A. Clinical assessment of self-injuries behavior. Psychol Rep 1997;80:155-60. 8. Saemundsson SR, Roberts MW. Oral self-Injuries behavior in the developmentally disabled: Review and a case. ASDC J Dent Child 1997;64:205-9, 228. 9. Pies RW, Popli AP. Self-injurious behavior: Pathophysiology and implications for treatment. J Clin Psychiatry 1995;56:580-8. 10. DenBestent PK, Mciver FT. Oral Self-Mutilation in a child with congenital toxoplasmosis: A clinical report. Pediatr Dent 1984;6:98-101. 11. Eguchi S, Tokioka T, Motoyoshi A, Wakamura S. A self-controllable mask with helmet to prevent self finger-mutilation in Lesch-Nyhan syndrome. Arch Phys Med Rehabil 1994;75:709-10.